http://fu.downloadsnow.net/ - tracks available at 96/24 resolution. "F.U. 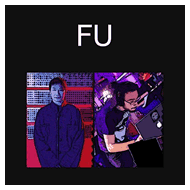 (aka Gary Chang and Anthony Baldino) makes electronic music of a different variety.... FU sets its course an intelligent yet eclectic path, gathering much of its influences from world music, r&b and ambient electronic music. Glitchmeister Anthony Baldino grew up in New York playing bass and golf, and now has the knack of turning his laptop into various musical sound sources. Gary Chang's film music past looms large in his experience as a sonic painter and espresso coffee drinker.. Together they make music that says, 'F.U.!'" On the synth front: "Lots of gear (the big Wiard, a small Eurorack setup with TIP TOP Audio modules, OTO Biscuit, Waldorf Wave....)."